Download The Cool, Entertaining Asimo Desktop Widget Now! A Windows PC with Windows XP, Vista or Windows 7 or a Mac with Mac OS X 10.4 or later. Internet connection. Adobe® AIR™ runtime installed. Asimo walks and runs around your screen, and performs many unique actions. Click on Asimo to start a new action. You can also drag Asimo anywhere on the screen. 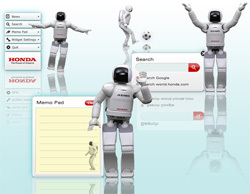 When available, Asimo displays the latest news from the Honda Worldwide site. You can choose from three balloon styles. You can drag the Menu window to place it anywhere on the screen.